It’s so confusing. Reading the advertisements, watching the television or walking the sport shows. How does one decide where to go on vacation? All the lodges and resorts claim to be the “best” or “finest.” They all have great pictures of sunny skies, huge fish and happy customers. It is overwhelming when it has to be narrowed down to one. So let’s explore how this decision can be made easily. Recently, I spent time with Mike and Marilyn Bilsbarrow of the Patricia Regional Tourist Council and they helped me process all this information in a very simple way. Here are some things they helped me better understand. What is the Patricia Region? The Patricia Region of Ontario, Canada which is commonly called “Canada’s heartland,” is an outdoor lover’s paradise. Approximately the size of Minnesota, this area is made up of 50% land and 50% water. Some pretty famous waters at that with names like Red Lake, Lac Seul, Eagle lake, Wabigoon, Savant, Sturgeon, Gull Rock, Minnitaki, and the Cedar River Watershed. The towns within the region you may also recognize, like Ear Falls, Perrault Falls, Red lake, Dryden, Sioux Lookout, Ignace, Vermilion Bay, Savant lake, Pickle Lake. Between these communities and watersheds lies vast unspoiled wilderness. Open, uncrowded spaces are alive with wildlife, wilderness and clean air. What is there to do? Obviously, angling is the large reason people vacation in the Patricia Region, and with this much water a person could fish a new lake everyday and probably not fish them all in a lifetime. Not to mention the diverse species available to the fisherperson. Walleye, northern pike, muskie, lake trout, smallmouth bass, perch, whitefish, crappie in the southern portion and some speckled trout in the northern rivers and stocked lakes. Or, if you’re looking for an alternative to fishing you can go sightseeing, golfing, shopping, wildberry picking, hiking, canoeing, photographing, or take in one of the many local festivals or industry tours. Growing in popularity is a thing called relaxation; it can be very rewarding, try it. With such a large area to choose from and a number of things to do, how do you decide where to go? Before you look at an ad or brochure before you go to a sport show, decisions must be made. On a piece of paper, write down your vacation goals, needs and expectations. Example: catching fish of a certain type, seeing wildlife, playing golf, access to shopping, personal medical needs, boat rental, guides, cabin on lake, family requirements, food service, main service, shore lunch, drive in facility, remote fly or boat in facility. In short, write down what you want to do, when you want to do it, and where you see it taking place. Now, take this information and compare it to brochures you have or ads you’ve seen. One thing that can be confusing is the lingo often used by vacation facilities. Let’s define. There are no hard and fast rules that apply to what is a lodge or resort. You must ask questions to see if the facility meet your personal preferences. Does the facility supply all the luxuries of home or is it a primitive cabin? Does each unit have its own washroom, or is it shared? Are there cooking facilities in the cabin or can I get meals at the main lodge? Does this have to be prearranged? What is the provided (linens, towels, utensils, maid service, fish cleaning, gam processing, dockage, launching, etc)? Are there managers on duty? Is there a store to purchase the things I forget? 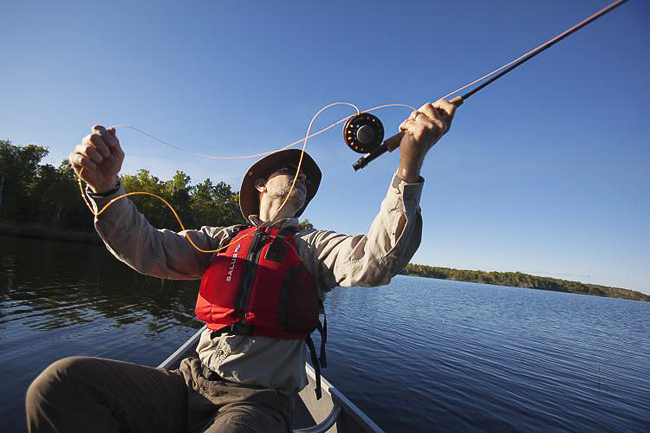 Is there a guide service available (tackle, bait, fishing license)? Will there be other kids my children’s age to play with? It is usually a cabin by itself away form the main facility, often times only accessible by water, air or remote road. It can be the only cabin on a lake, usually not staffed. Things to question when looking into an outpost could be if a map of the lake is available. Is there a communication system available for an emergency or do they have check flights during the stay? What doesn’t the cabin have? WHAT IS THE AMERICAN PLAN? Although plans may vary from lodge to lodge, the American Plan usually means a package plan including lodging and meals. Sometimes two meals, sometimes three meals or may include guides, maid service, boat, motor, gas, bait, shore lunch prepared or box provided along with any number of extra amenities not normally included in regular packages. Be sure to clarify with operator their definition. Most often a package plan that includes a cabin with cooking facilities. Since there are no rules, all plans are not created equal. Some include linens and towels, some include boast/ motors, some include fishing license, some include dish soap so it is important to as what is included or maybe more importantly, what to bring. On behalf of Mike and Marilyn Bilsbarrow of the Patricia Regional Tourist Council, we hope this answers some of the questions you may have about planning a getaway.